Cases that show how our LED Grow-lights improved crop yields. These are the preliminary test results from the first grow cycle using EconoLux's 45W linear LED grow-light. Results showed that exposure to the McCree curve light (with extra UV and blue), increased the size of the red lettuce under the lights by about 3 times! LIGHT: We have provided a Hong Kong Aquaponics Greenhouse with a sample of EconoLux's 45W Linear LED grow light. These are the preliminary test results from the first growth cycle. SPECTRUM: The 45W LED grow-light light has a spectrum optimized for cloning or growing greens. The image on the right shows the PPFD spectrum, with the McCree curve overlaid (at 90%), and the spectrum of sunlight overlaid (at 85%). Note the close match of the light to the McCree curve. The additional UV and blue light, which is more than the McCree curve, but which is preferred by seedlings, clones, Micro-greens, herbs, basil, lettuces, and other leafy green plants. The photo (on left below) shows the test growing pontoon in the Aquaponics pan. The 45W linear LED light is visible on the right. Note that the lettuces below the light are larger and healthier. The photo on the right below shows the crop towards the end of the 30 day growing cycle. Note that the lettuces have better coloration, than the neighbouring rows which have less exposure to the LED light. 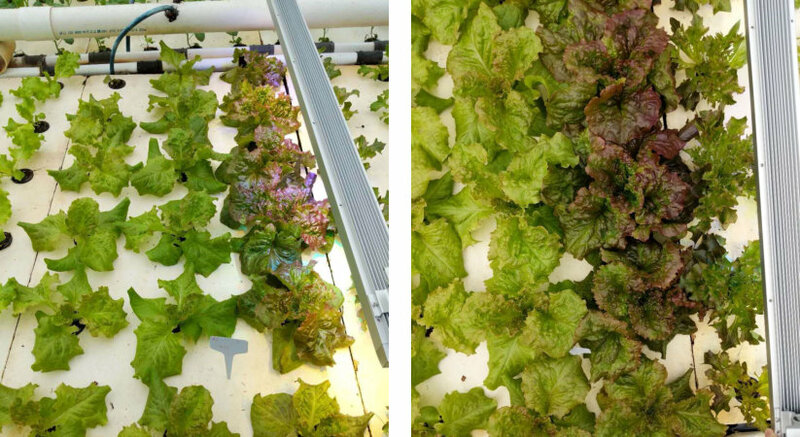 The photos below show representative samples of the lettuce plants after harvesting. The plants on the left of the photos had no exposure to the LED light. The plants in the center of the image had some exposure to the LED light, while the plants on the right of the photos were grown directly under the LED light. Compared to the other lettuce plants, the plants grown directly under the LED lights have a more intense and sweeter taste; the texture difference is huge, as they are a lot cruncher. Under far less than ideal conditions, the lettuce grown directly under the LED lights is 3.7 times heaver than the ones grown without the lights. There are also taste and texture improvements. If we can raise the ambient air temperature by 10C constantly, and supply more air to the root zone (nano bubble), than we expect we can produce 200~250g lettuces in 30 days (currently we can grow the lettuce to 500g in 50 days). NOTE: While the test grow used red leaf lettuce, the results should be similar for other leafy green plants, and also for cloning and germinating cannabis plants.